For ages now I have heard good reviews about the Orange Top Inn on Route 17 in Tuxedo. Folks bragged about their seafood selection and the Italian specialties. So I figured I’d go see what they were talking about. When you walk in you see that it is a no-frills basic eatery, quiet, and clean. I helped myself to a booth and perused the menu. It had all the customary things you’d expect. I focused in on the seafood and Italian sections. I do love my seafood but I have that all too often to continually report on it herein. They had fish and chips, flounder, and fried clams. They had all the usual Italian specialties too. My seating neighbor whom I actually knew from attending church at the nearby St. Elizabeth’s Chapel now and then and she was having a deliciously-looking salad platter of cole slaw, tuna salad, and potato salad with big scoops of each. I finally decided upon the spaghetti and meatballs. Right away they came with my salad and hot rolls. They had my favorite honey mustard dressing which always wins points with me. The salad was nicely sized consisting of lettuce, cucumbers and tomato. The tomatoes had a nice flavor considering this time of year when tomatoes all seem to taste like straw so I was pleasantly surprised by that. I had about half-way finished my salad when my main course arrived, which is how I like it quite actually timing-wise. It was a full plate of pasta and they brought me extra marinara sauce which was modestly spiced and sweet just as I like it. It came with two goodly-sized meatballs (I would have preferred three but not a deal breaker). Altogether the ingredients blended together very well indeed. The pasta was al dente which is again as I like it as I don’t enjoy chasing sloppy wet spaghetti all over the plate. As I was enjoying the meal in between bites I engaged in conversation with the people off to my side and behind me which contributed to the unrushed, quiet, and friendly atmosphere of the place. I washed it down with my predictable seltzer with a lemon wedge. The waitress offered me dessert but I was very pleasantly and comfortably full so I called it a day. Without a doubt it was a pleasant experience with a nice familiar meal amongst friendly folks. 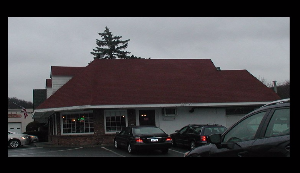 For a family dining experience, the Orange Top Inn is a nice place so if you happen to pass by, stop in and see for yourself.